The Olympics have officially arrived here in beautiful British Columbia. The flame has traveled through the surrounding Greater Vancouver area and is arriving at the Opening Ceremonies today. I had the rare privilege to view the first dress rehearsal Monday night and plan to watch the broadcast. 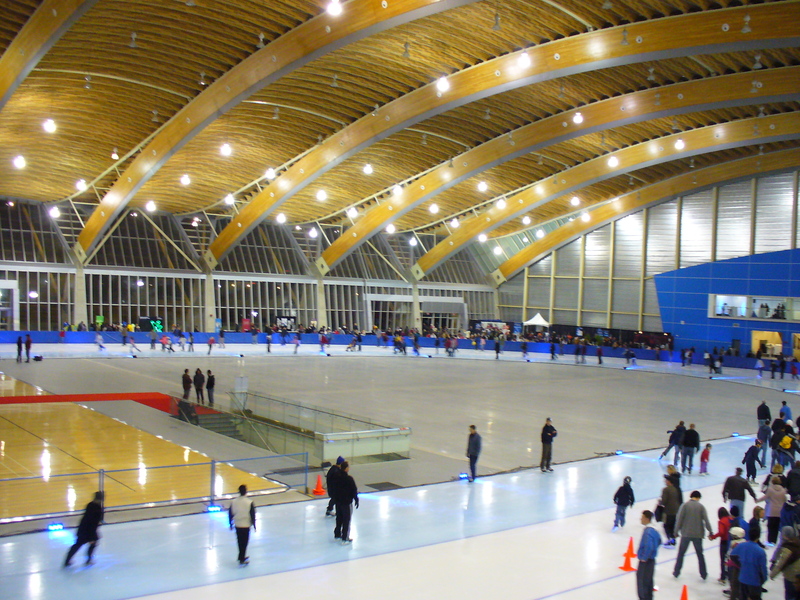 In honour of the Olympics I am musing on the design of the Richmond Olympic Speed Skating Oval, that is located in my neighbourhood. 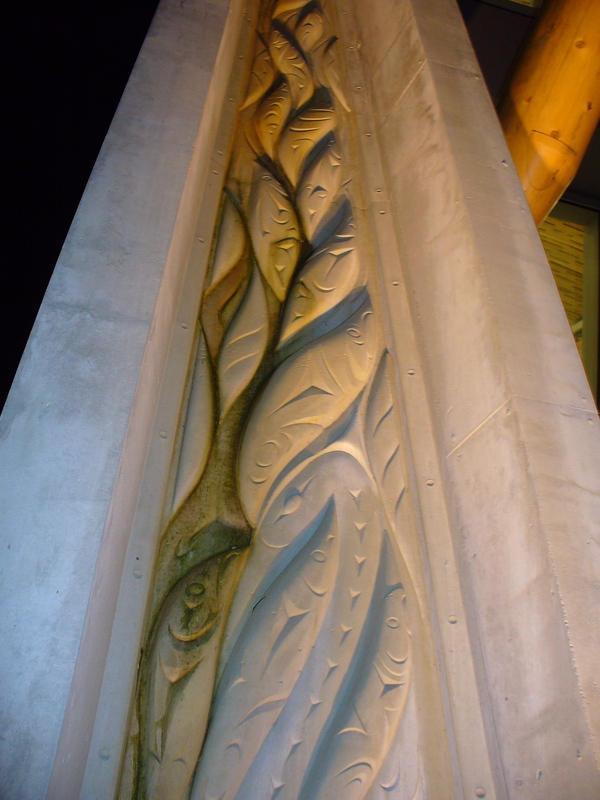 This exterior detail is of a rain runoff trough (a ‘Buttress Runnel’), the Native design is of salmon swimming up river ~ designed by artist Susan A. Point. In honour of the mighty Fraser River on which the Olympic Oval is located , the rich history of fishing in the region (Richmond is home to the second largest fishing fleet in Canada and canneries use to line the Fraser), and the Native origins of Richmond. 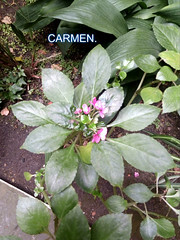 This also serves a very practical function of rainwater collection for the plumbing system and landscape watering. 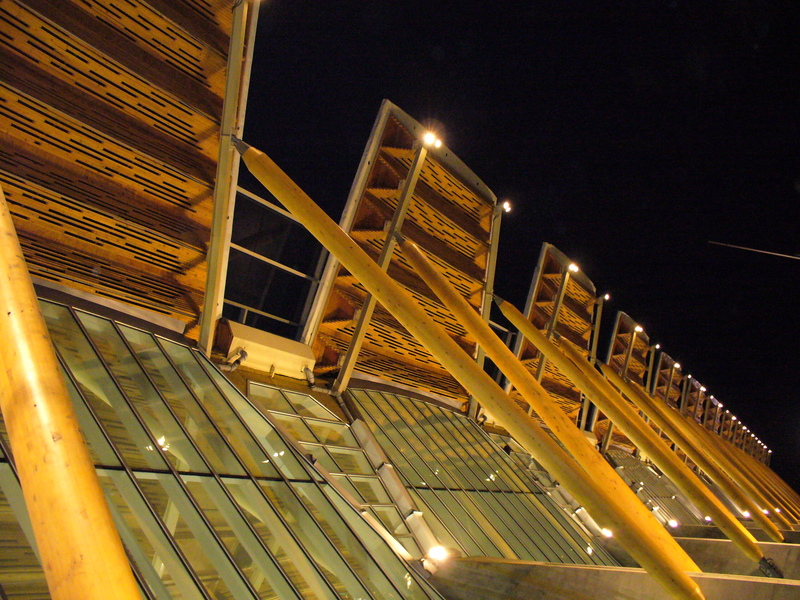 The building encapsulates West Coast Design ideals. Its contemporary design includes glass, cedar, cement and has an abundance of natural light. Innovations such as rainwater collection, using heat leftover from ice making to warm the building and many other Eco decisions gave this 512,000 sq’ multi-use facility a LEED Silver Certification. 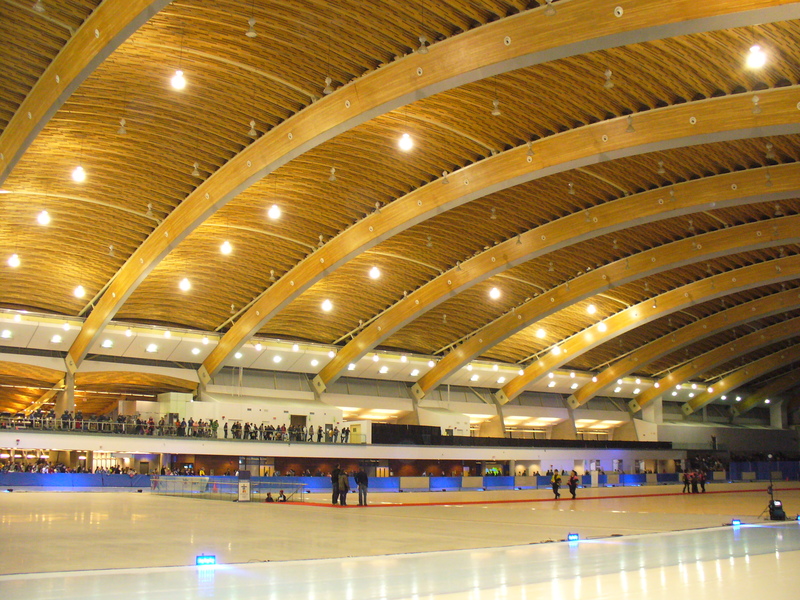 The design, construction and sustainability of the Richmond Olympic Oval has won multiple local and international awards, most recently the top award for a Sports or Leisure Structure from the Institution of Structural Engineers in London England. View from ice level as practicing speed skaters warm up. The track is 400 meters and seats 8,000 spectators. 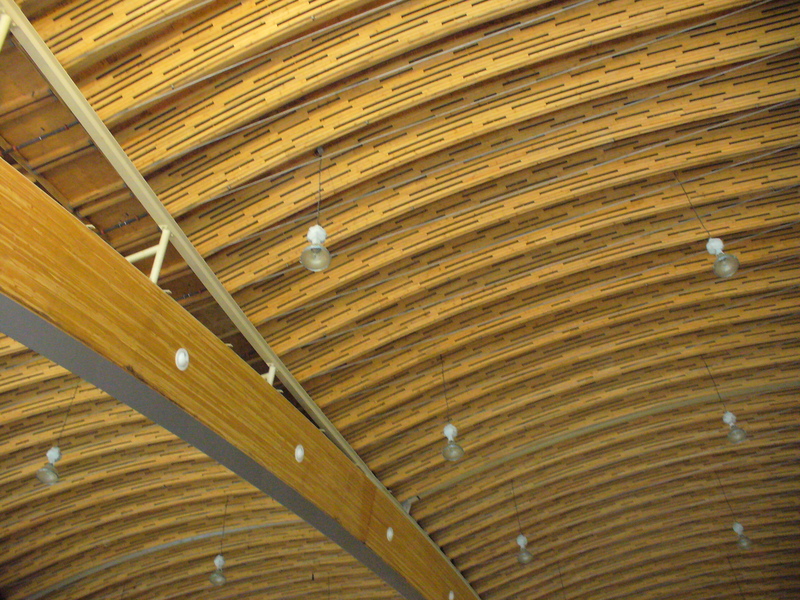 One of a kind, award winning wave design, arched trusses and rafters made from BC wood. 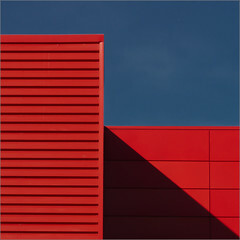 Roof detail. 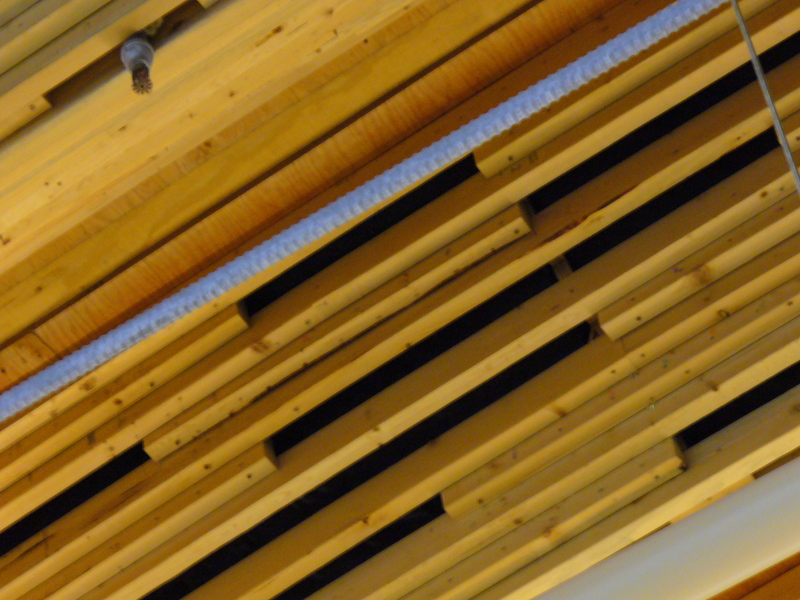 The unique and innovative ceilings are built using beetle killed pine wood. BC has suffered a devastation of its pine forests in recent years due to an invasive beetle. 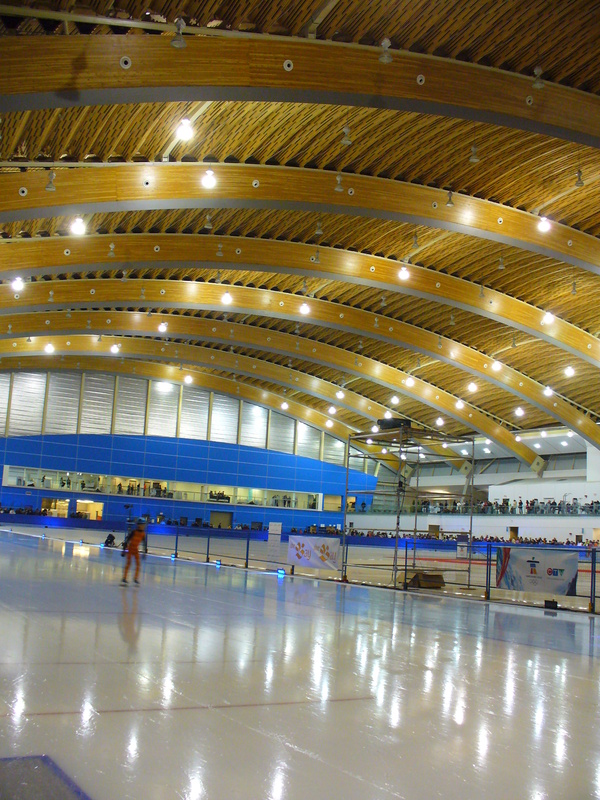 The wood from the tree killed by the beetle has a bluish coloured tinge to the wood, which has been incorporated into the ceiling design of the Richmond Olympic Oval. Built for $178 million on 32 acres of Richmond City riverfront property, it also includes a plaza and public art display. 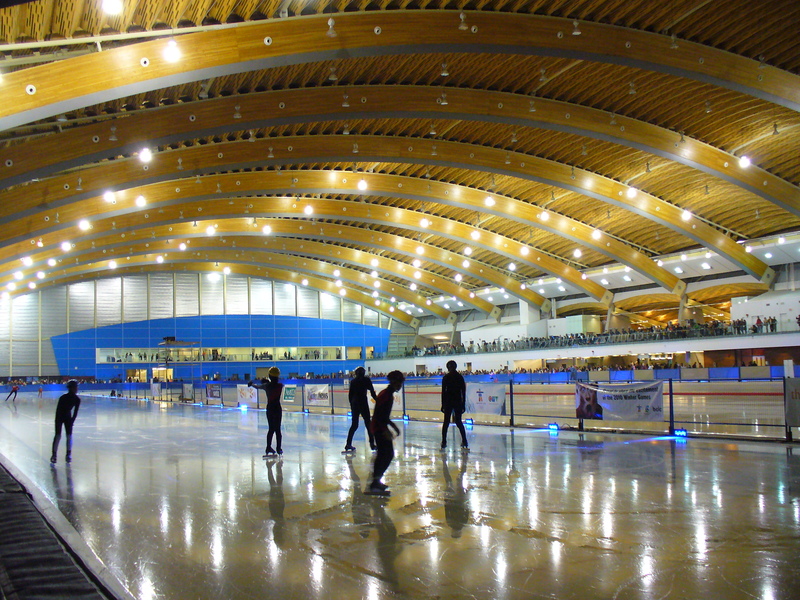 Opened December 12th, 2008 – where these photos of the first official skate were shot. 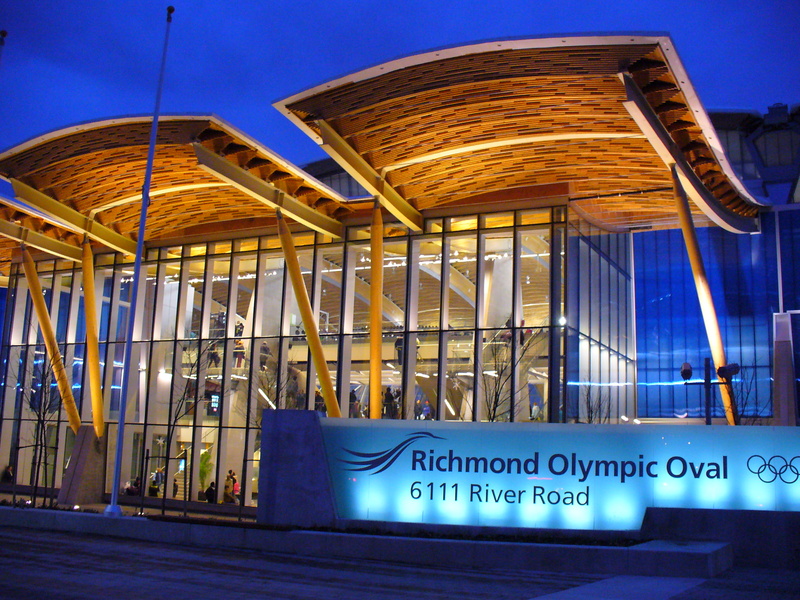 After the Olympics leave town, the residents of Richmond will enjoy the new venue. Floorball anyone?